As a rule I don’t watch reality TV – I can’t stand the squirming embarrassment I feel for each and every participant as they try to engender love (but more frequently loathing) through the various traumas and triumphs that take place during their sordid little 15 minutes of fame. But lately I’ve found it useful. It has become a way of connecting with my pubescent daughter before she plummets into the abyss of teenage angst and shuts me out completely. 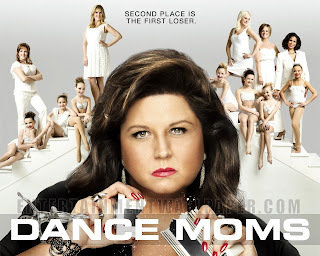 We can connect over America’s Next Top Model, The Voice, The Block, Four Weddings and possibly most distressingly Dance Moms. I draw the line at Wife Swap. And while we don’t always see eye to eye on the content or contestants, at least it opens a dialogue about touchy issues like body image, self esteem, etiquette and most importantly – hair and clothes. I only hope she doesn’t aspire to appear in a reality tv show or worse still, start living vicariously through these dunderheads. All the shows are pretty much the same and attract a similar bunch of narcissists who willingly subject themselves to a series of often particularly cruel humiliations in their quest to win, win, WIN. Petulant behaviour, screaming and tears are par for the course. It’s all great fun until someone gets hurt. And maybe that's the lesson we take from 'reality' tv - real life isn't a competition.